Menulog delivers for Hot Fried Chilli Chook so you'll be able to track your courier on a map. Snack on a cheeky crunchy treat before tucking into your don bowl! Our signature giant hot fried crumbed chicken with your level of spice. Add chips and sauce! Who needs cutlery? Pick up one of our signature giant crumbed chicken breasts. Choose your spice level and get stuck in! 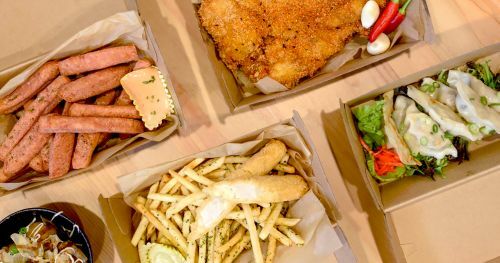 Signature giant crumbed chicken breast and a size of double fried crunchy french fries. Mouthwatering. Our vegetarian crumbed fish (actually made from red beancurd!) and double fried crunchy chips. Spiced pork meat chips with double fried crunchy chips. Octopus ball with double fried crunchy chips. Wash your meal down with a refreshing drink!